When moisture collects over time in any Houston home or business, this can be highly problematic – after all, moisture has the potential to completely destroy your foundation, drywall, wood, flooring, and other furnishings. And, not only this, but moisture itself is the main contributor to mold and other bacteria formation. AdvantaClean of Houston Central is focused on preventing moisture issues from becoming a bigger problem than they should be. Our Houston teams are skilled at addressing the source of the liquid build-up, and providing wholly effective solutions, no matter the cause. Crawlspace Moisture: Crawlspaces are a virtual hotbed for collected pools of humidity, since they’re so tucked away and difficult to reach. 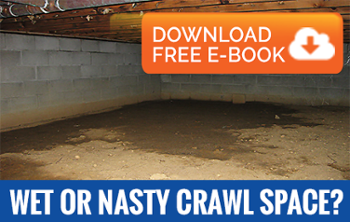 Crawl space moisture can really become a serious issue for home and business owners alike if left untreated. Kitchen Moisture: Thanks to the presence of dishwashers, fryers, and other appliances that generate clouds of steam, commercial kitchens are one of the main common sources of moisture build-up. Restroom Moisture: Since most properties have on-site restrooms, this space is frequently one of the main causes for moisture growth – even normal condensation from a hot shower or bath puts this room at risk. Attic Moisture: When there’s a notable absence of proper ventilation, moisture can easily become trapped – leading to troublesome mold growth. Narrowing in on the source of your attic moisture is key. Laundry Facility Moisture: Moisture build-up can easily occur in your laundry room, due to the presence of steam or potentially leaky plumbing and appliances. If you need assistance in making sure the presence of moisture in your Houston home or business doesn’t turn into a larger issue, AdvantaClean of Houston Central is here for you! Our moisture control experts are skilled at locating the root cause of the problem, and developing successful repair strategies that work. Remember, being proactive about potential moisture growth is the only way to prevent the spread of mold – AdvantaClean is dedicated to making sure that your business or home in Houston is kept free from problematic moisture and mold growth. Crawl Space Moisture Control Solution Experts! Call Us Today – (713) 496-0511!